enmity. 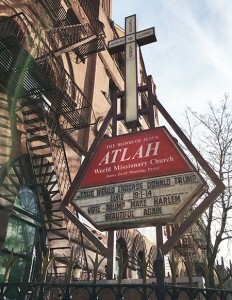 Its Pastor David Manning is known as the ‘Hate Pastor of Harlem” because of the inflammatory, anti-Obama and homophobic signs prominently displayed along the church’s Lenox Avenue façade. These signs grow more offensive each year and the community has been unsuccessful in eliminating divisive, intolerant messages. Manning has close ties with the GOP far right, birthers and has endorsed Donald Trump’s presidential run. Alas, a plot twist emerges. The Atlah Church is to be sold at a public auction on February 24 because of its antsy creditors and its $1.2 million of debt. To be sure, scores of developers, investors, and gay organizations will compete at the auction. However, combative, obstreperous Pastor Manning, will not go quietly into the night! Maya Angelou, the late literary lioness, internationalist, civil rights advocate is still dominating headlines. Her fully rehabilitated brownstone, located at 58 West 120, in Harlem’s historic Mt. Morris Park District, is on the market with a $5.1 million price tag. Last year most of her artwork was sold at auction and fetched more than $1 million. A few years ago, she donated the Maya Angelou Collection of Personal Papers to the Harlem-based Schomburg Center for Research in Black Culture. It was a gift of inestimable value, arguably her greatest asset.